We got to our hotel in Paris around 10 AM, checked in to our room at Hotel du Cadran, grabbed our backpacks, and ventured out into the city. Our first stop was Paris’ Notre Dame Cathedral. It started raining almost immediately when we got out of the metro station, so we went straight into the cathedral without spending any time outside. The inside of the cathedral was beautiful, but I really wanted to go up into the towers. Thanks to the rain shower (which passed quickly) the line for the Notre Dame Towers was fairly short, so we didn’t have to long to wait. As I understand it, the gargoyles are used as water spouts to direct the flow of water off of the cathedral roof. I assume that everything without a water spout is a chimera. Chimeras are mythological fire-breathing creatures, most often portrayed as lions, though I did not see any lion-esque chimera at Notre Dame. 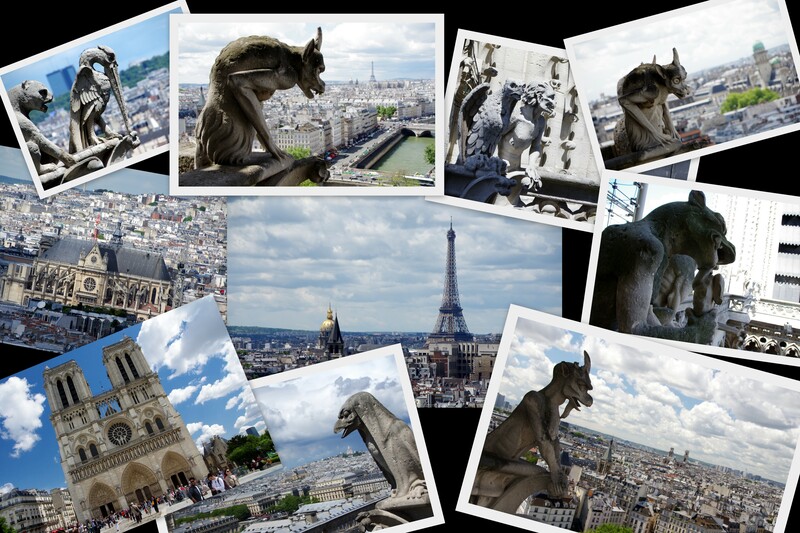 Being eye-level with the chimeras was amazing, and the views of Paris were spectacular. The 387 step climb to the top of the South tower was well worth it! I was amazed to see that each of the chimeras on the upper levels of the cathedral appeared to be unique. So much thought and artistry went into the design of older buildings. It always amazes me that mankind was able to accomplish so much with such little technology. According to the cathedral’s website, the gargoyles and chimera were installed during the 17th and 19th centuries and were designed by Viollet-le-Duc and Emmanuel Bell. 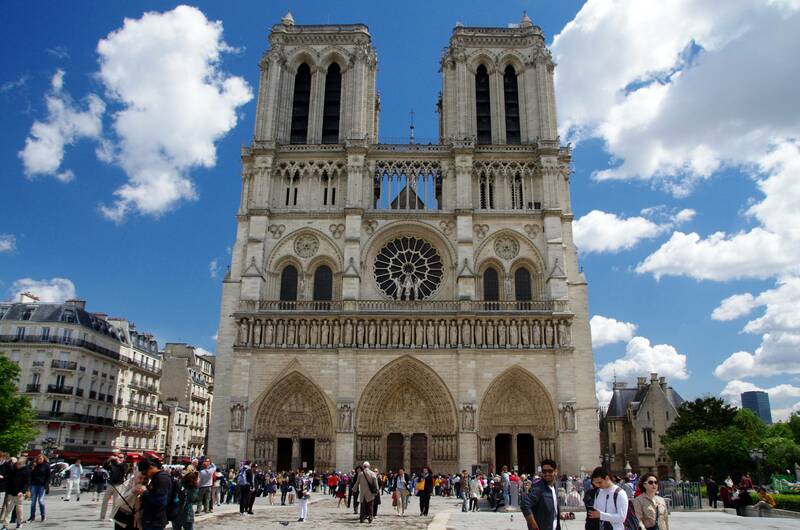 For reference, I thought I’d include a photograph of the front of the cathedrals so that you can see where the towers are. The South tower is on the right.